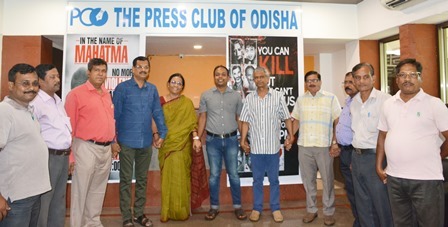 The Press Club of Odisha (PCO) protested the repeated attacks on the media in the country on the occasion of the birth anniversary of Mahatma Gandhi yesterday. Several journalists and photo journalists of the state gathered at the office of the PCO and held a meeting condemning the attack on journalists. Under the leadership of PCO President Tathagata Satpathy, they also formed a human chain to send a message of peace. The Press Club of India had called upon all press clubs of the country to observe the day. The media fraternity in India is up in arms over the recent killings of senior journalist Gauri Lankesh and young reporter Shantanu Bhowmik.